Wood, Frank Watson (1862-1953). Watercolour signed and dated 1929 (lower right). Entitled "Early Morning, HMS QUEEN ELIZABETH Leaving Portsmouth". With '1929' added by the artist (lower right), placing the actual occasion of the event in this watercolour is not quite so simple: but 1929 it is not! By that time her distinctive two funnels - as shown here- had been replaced by an even more distinctive single trunked funnel in a refit that startd in 1926, and so that means we are looking at the ship as she was pre 1926. A further clue as to the date of the event shown here is HMS VICTORY who is lying to her moorings over on the left of the painting: she was moved out of the stream in Portsmouth harbour in January 1922 and placed in dry dock. We are therefore now looking at pre 1922. 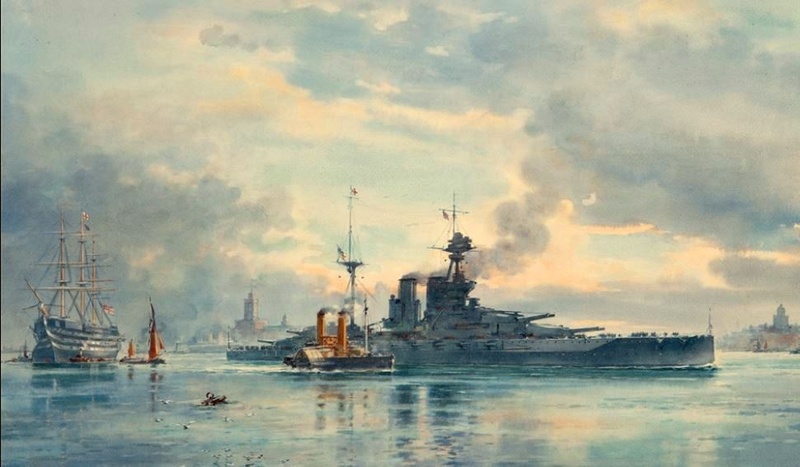 During the latter years of the Great War QUEEN ELIZABETH, Admiral Beatty's Grand Fleet flagship, was stationed first in Scapa Flow and then in the Firth of Forth: she was far too busy prosecuting the war to come south to Portsmouth and this anyway is not a painting of a naval base or a battleship at war. April 1919 saw Beatty haul down his Union Flag (he had been promoted Admiral of the Fleet and was thus entitled for his remaining few days afloat to hoist this flag) on QUEEN ELIZABETH when he was relieved by Admiral Sir Charles Madden who became C-in-C of the now newly named Atlantic Fleet: QE continued to be the flagship. We have thus arrived at the period 1919-late 1921 as the most likely date of this view of the battleship leaving Portsmouth. From the main topgallant flutters the George Cross of a full admiral, in this case as we believe, Admiral Sir Charles Madden Bt GCB GCVO KCMG, Commander-in-Chief Atlantic Fleet. In command of HMS QUEEN ELIZABETH and Flag Captain to C-in-C Atlantic Fleet is Captain the Hon Matthew Best DSO* MVO RN. Its an early morning departure for the battleship whose movement down harbour will have been dictated by the tide: to retain maximum control of his ship Captain Best will want the tide to be on the make so that as she passes through the narrows of the entrance QE is stemming the incoming stream. (Wood clearly shows this by the water piling up against the southern face of the buoy which lies, left foreground of the painting). HMS QUEEN ELIZABETH was to remain in the Atlantic Fleet until July 1924 when she transferred to the 1st Battle Squadron as flagship of the Mediterranean Fleet. The back of the framed picture bears a label: 'Captain J A C Henley DSC RN, Lamberhurst' [West Kent] which suggests he was once the owner of this painting. Captain Henley (1913-2003) served in QUEEN ELIZABETH as a Cadet and Midshipman in the Mediterranean in 1930-31 and subsequently saw service afloat in HM Ships EAGLE (carrier), SHROPSHIRE, BERWICK (heavy cruisers), DUNCAN (destroyer leader), MAURITIUS (light cruiser), CHARITY (destroyer) and CENTAUR, the aircraft carrier which he commanded in the early 1960s. He was awarded the DSC for service in the Korean war in 1951 whilst in command of HMS CHARITY. Frank Watson Wood’s paintings appear thick and fast in Maritime Originals' portfolio because he was not only good but prolific too! He was especially successful at capturing scenes such as this one  his eye for ships’ details is always good (he was a draughtsman after all) and he does paint glassy calm seas and colourful skies with that particularly appealing style he made his own. His output was impressive although he didn’t always use the best of artist boards and papers it seems for some of his paintings of this period – many over a century old now – have become foxed and faded: not so this one which is in pristine, bright and unfaded condition. Wood, who received an impressive number of Royal commissions and travelled with The King and Queen to Canada and the USA on State Visits in 1939 as Artist in Residence - died in 1953 at the ripe old age of 91. His watercolours appear to be enjoying a sustained period of renewed interest amongst marine art collectors (2018). THIS POOR IMAGE WILL SHORTLY BE REPLACED BY A BETTER ONE!